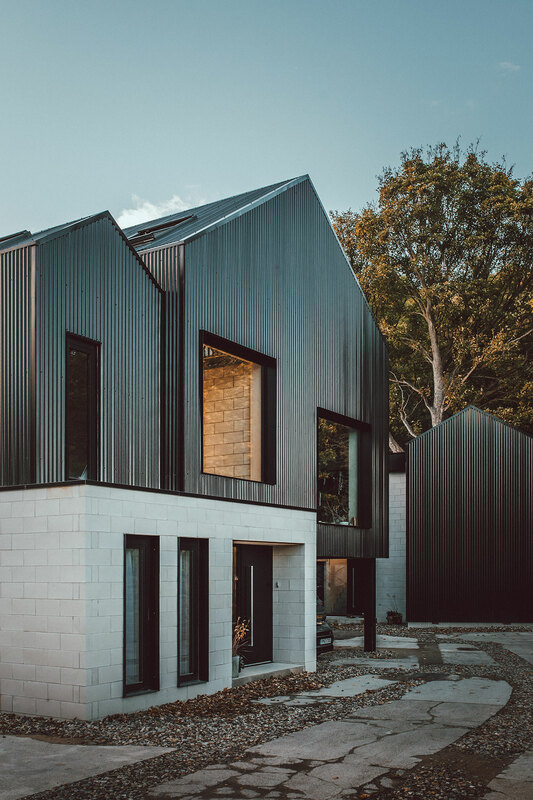 Designers, gallery owners and identical twins Nik and Jon Daughtry had a dream of building their family homes next to each other, by themselves no less. 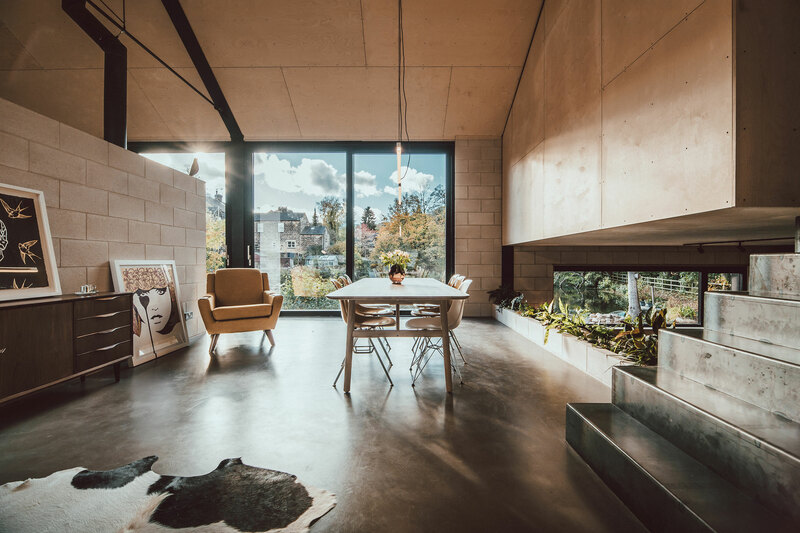 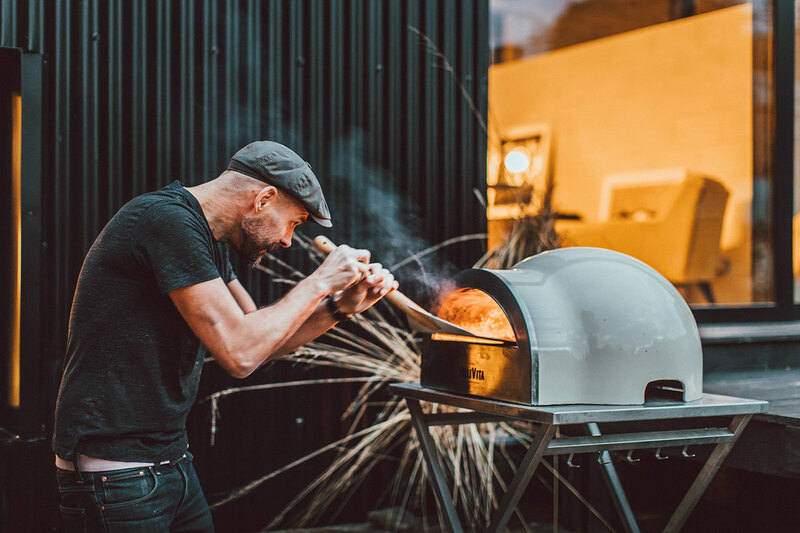 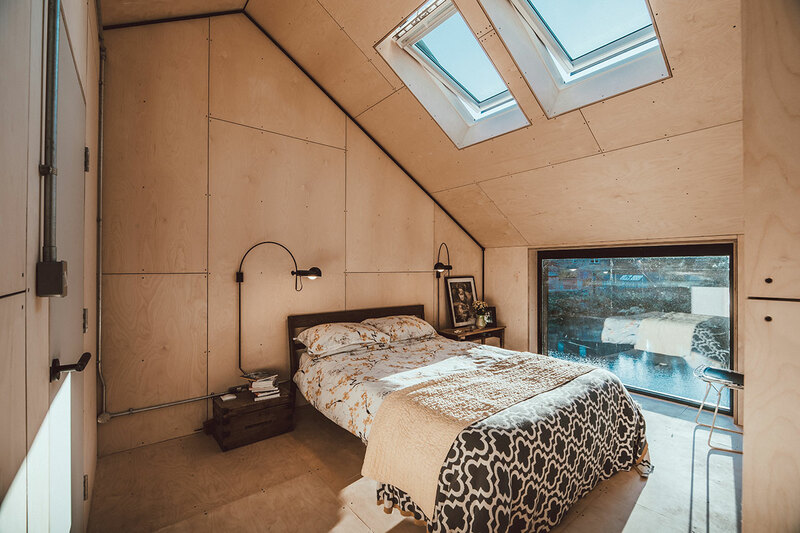 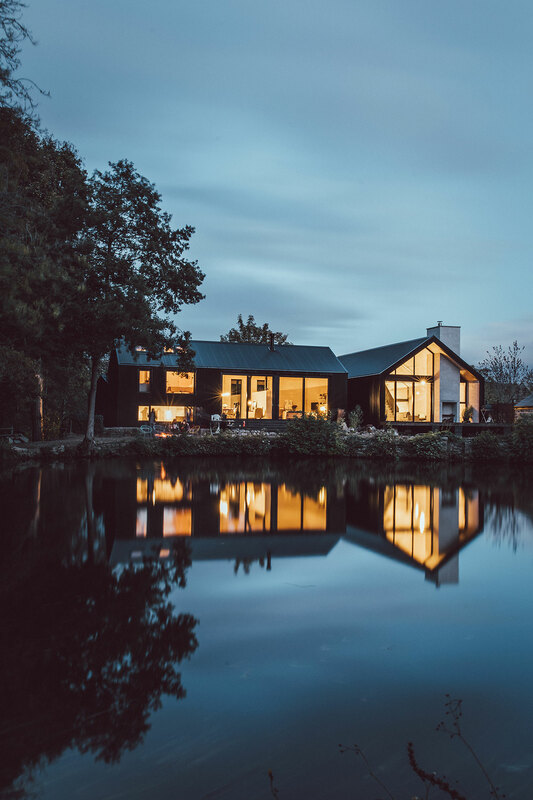 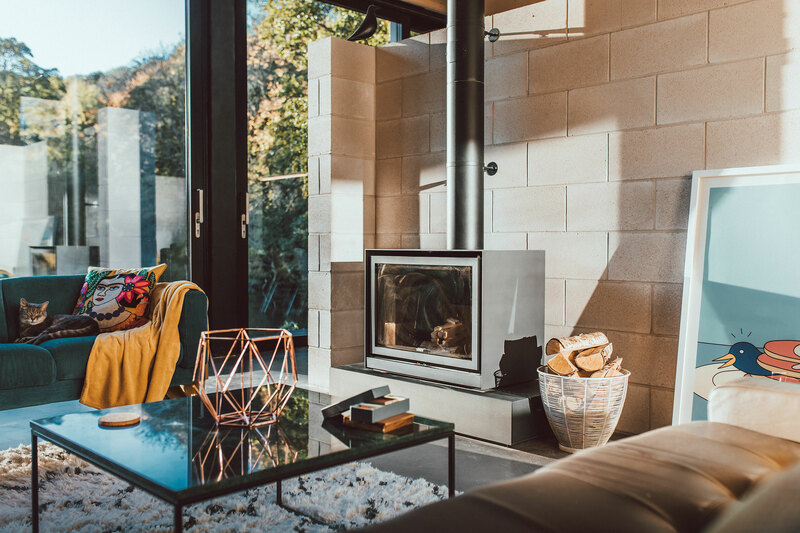 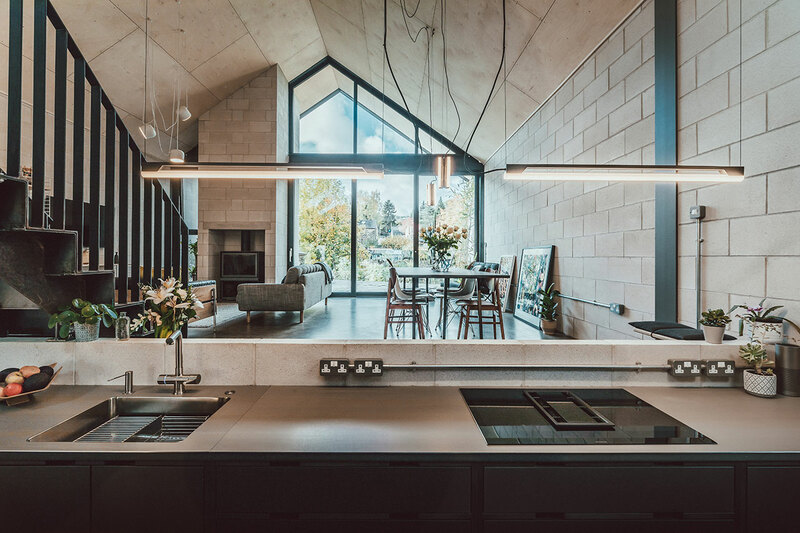 With some help from English architects CODA Bespoke, their dream not only came true but it has also attracted national acclaim when it was named Best Residential Development at the 2018 Northern Design Awards. 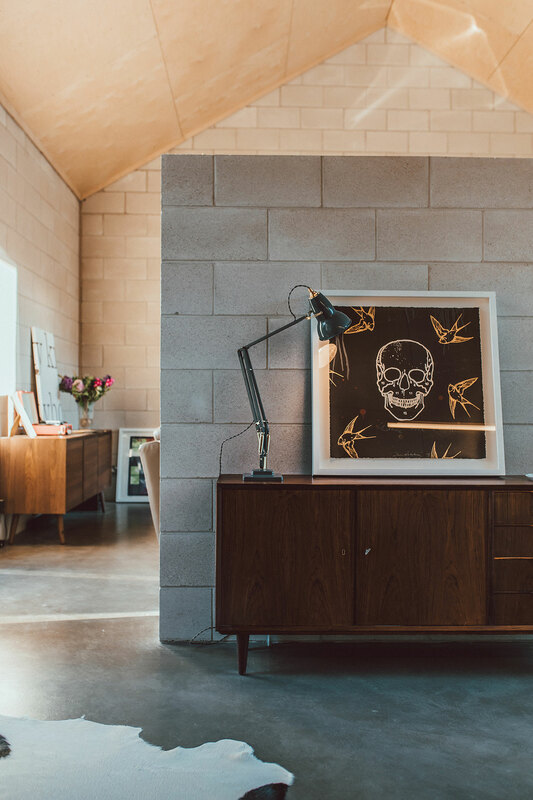 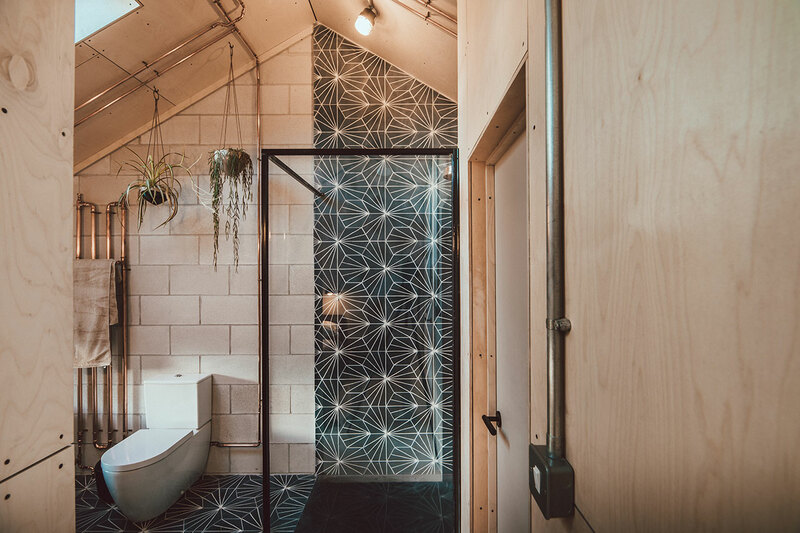 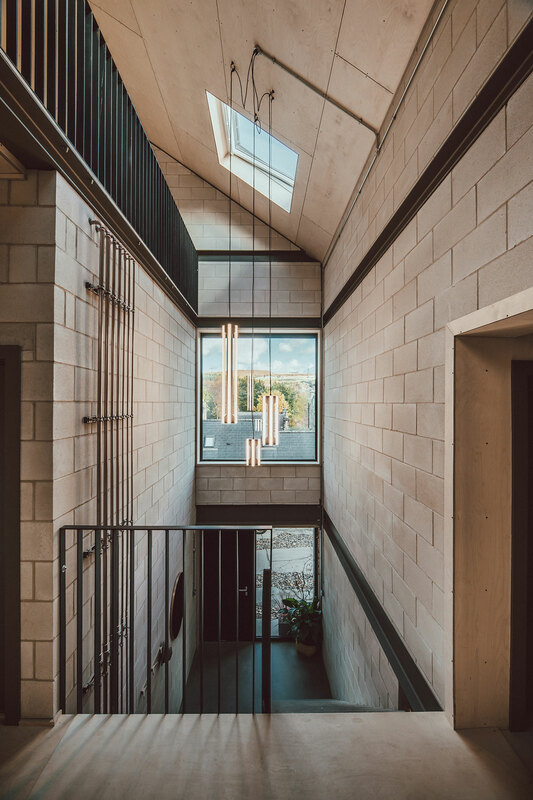 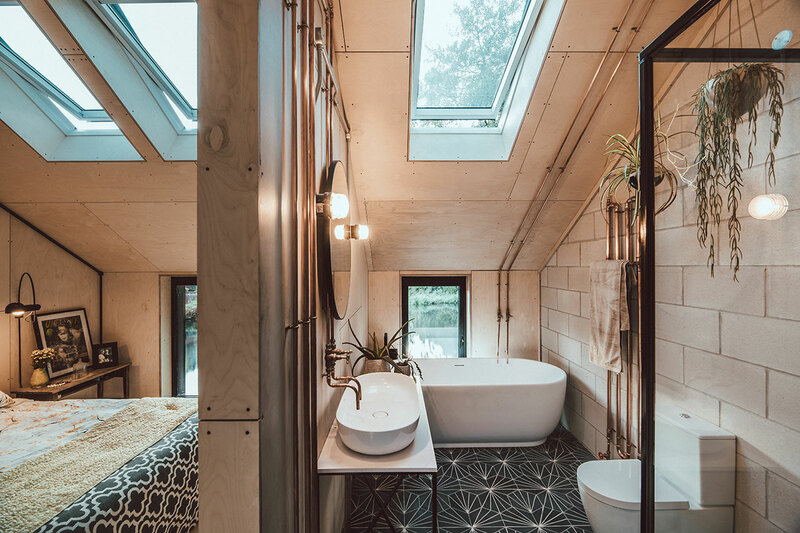 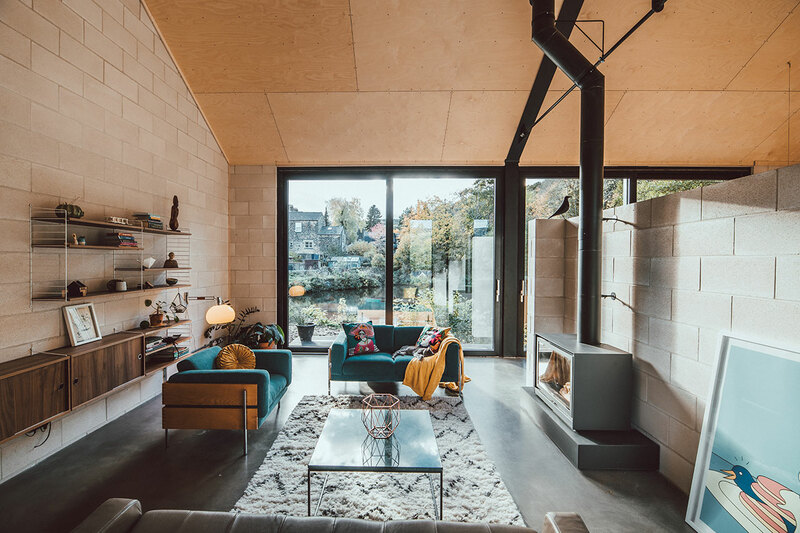 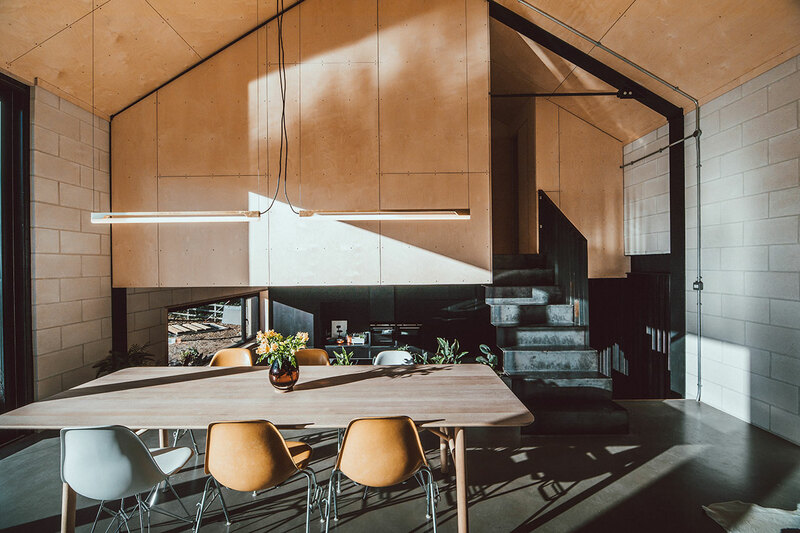 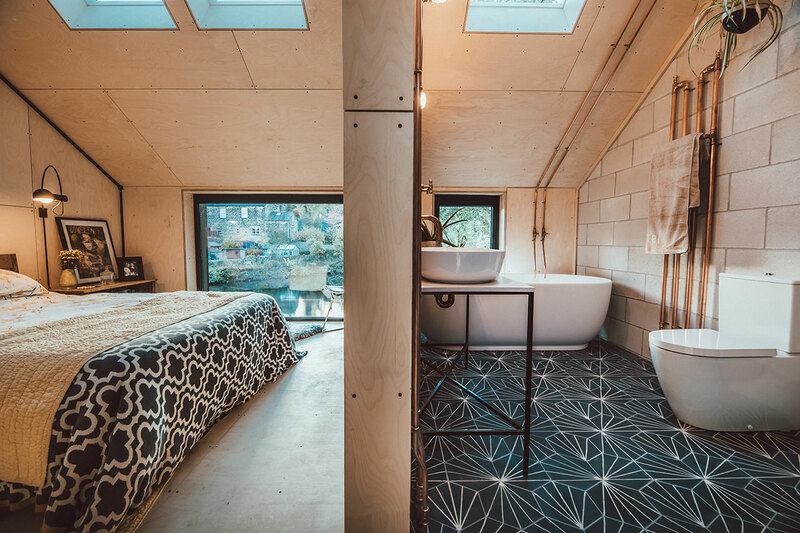 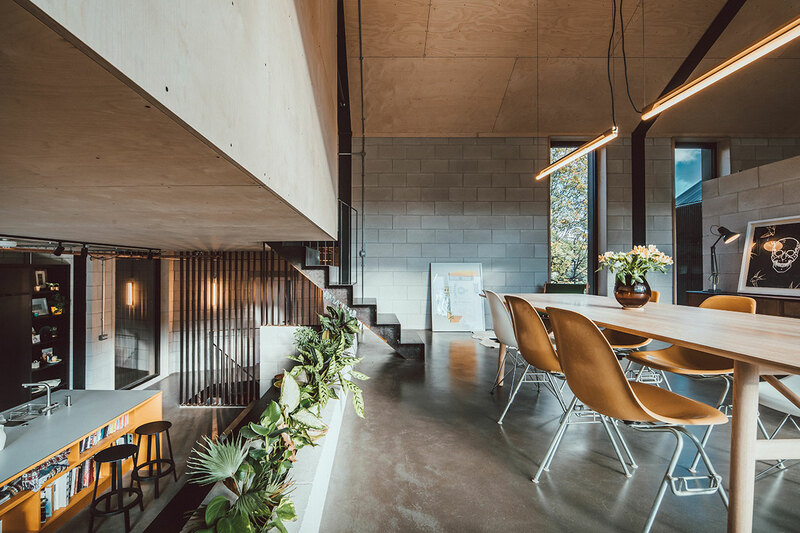 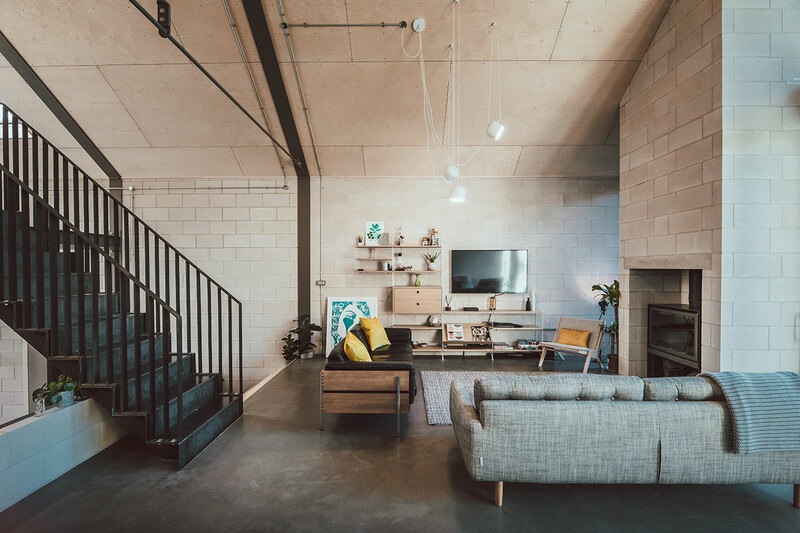 Built on an old industrial site in Oughtibridge in the north of Sheffield, UK, where a 200-year-old corn mill used to operate, the fittingly named ‘Corn Yard’ was designed for low maintenance living based on the use of untreated materials, exposed services and energy efficiency. 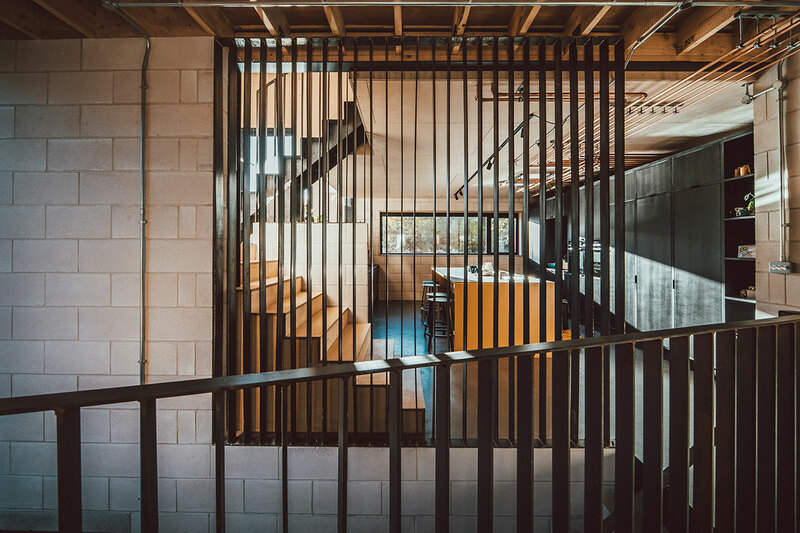 The bothers’ hands-on, no-frills approach has resulted in a truly functionalist architectural design whose beauty has been painstakingly imprinted into the building fabric during the 18 arduous months they spent digging, building, painting, varnishing, sanding, and waxing. 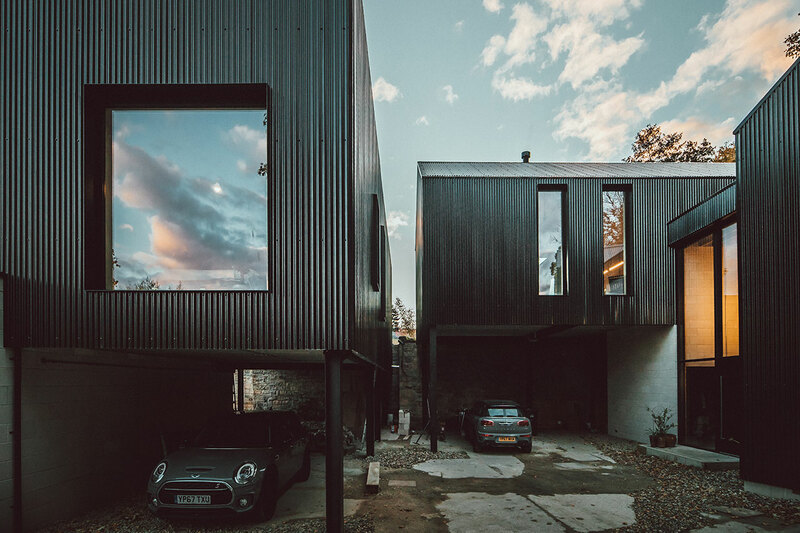 Located amidst lush vegetation next to a mill pond, the only reminder of the site’s industrial past, the twin houses are built on stilts enabling the creation of parking spots underneath while at the same time allowing for expansive views of the surrounding nature courtesy of large glazed areas. 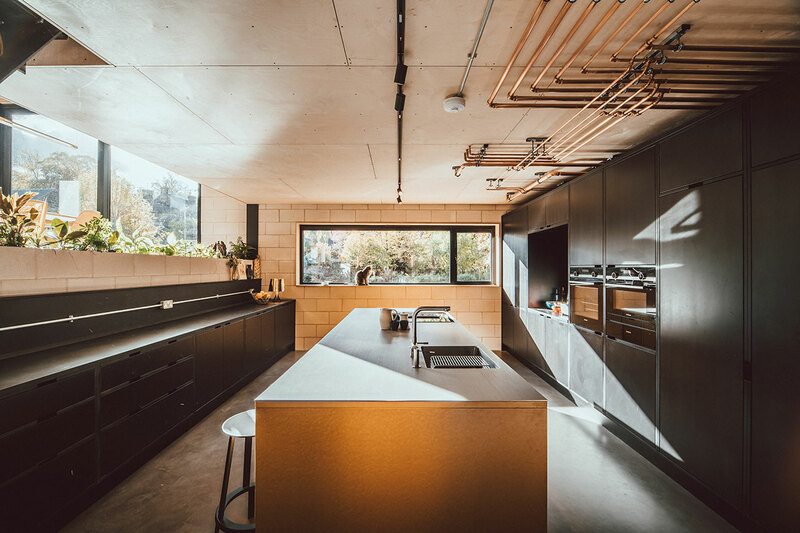 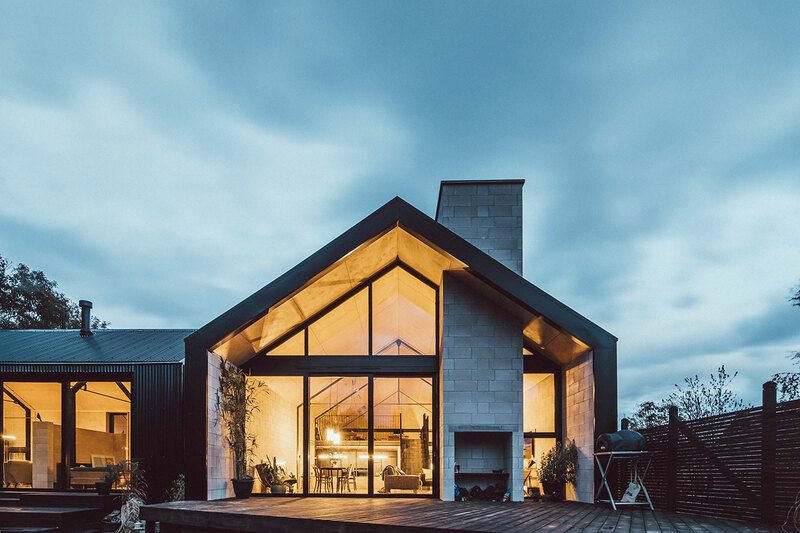 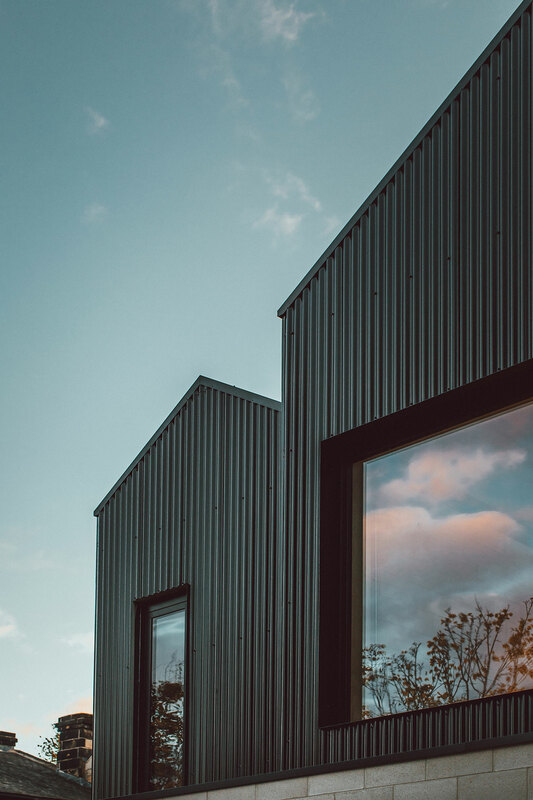 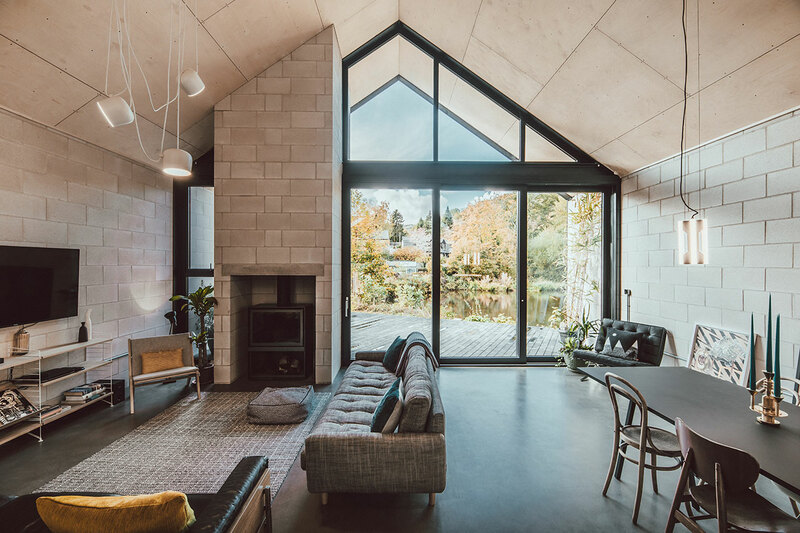 Clad in black corrugated steel and super insulated to minimize energy loss, the houses have been sustainably designed as further attested by the fact that both the underfloor heating and hot water systems use energy extracted from the pond. 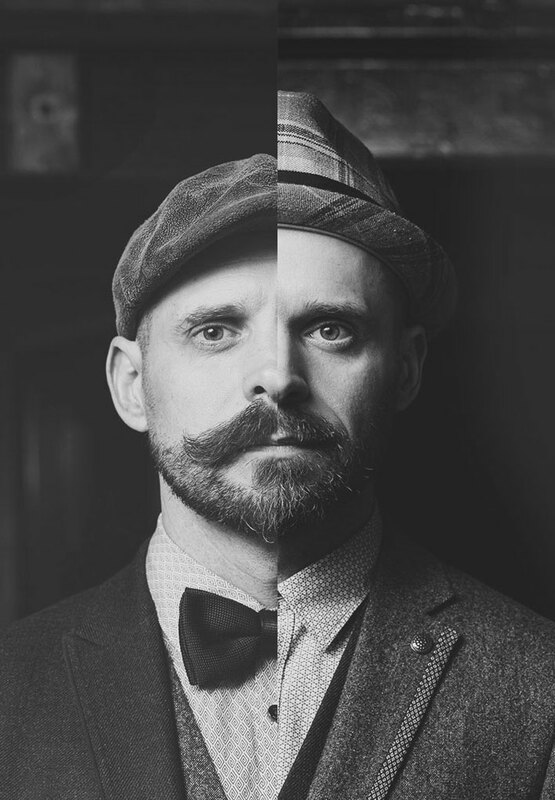 Nik Daughtry (on the left) and Jon Daughtry (on the right). 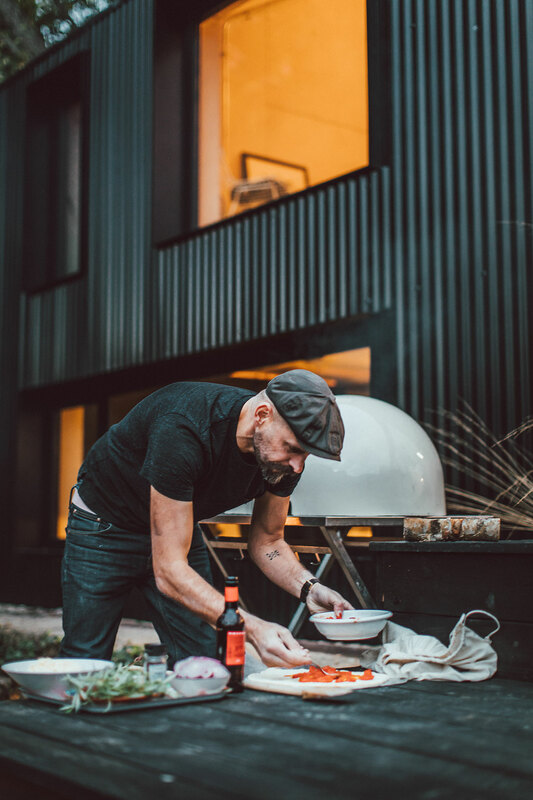 Photo by Mark Howe. 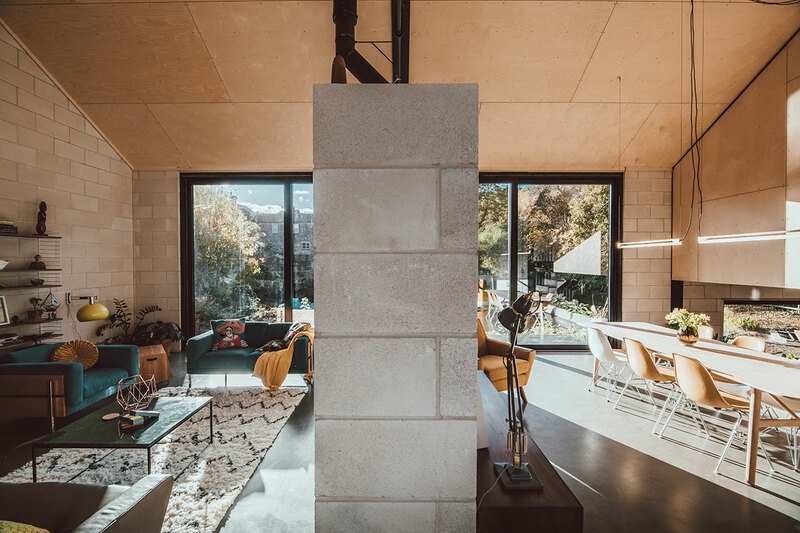 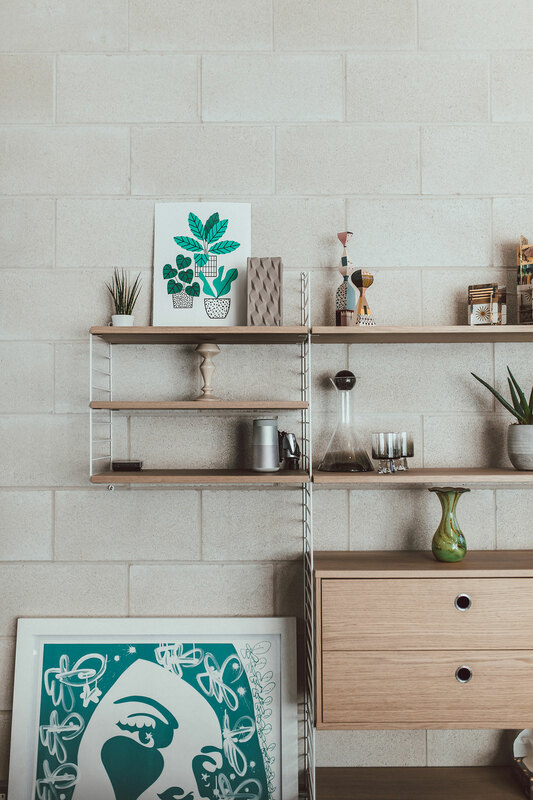 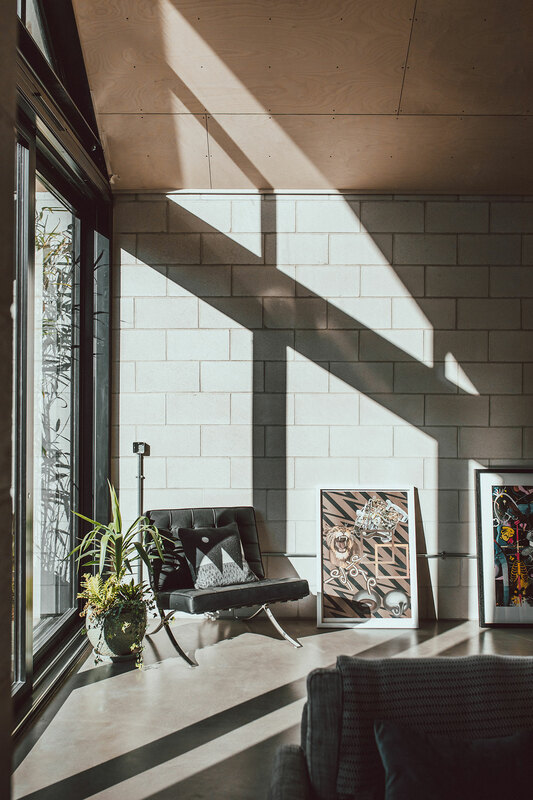 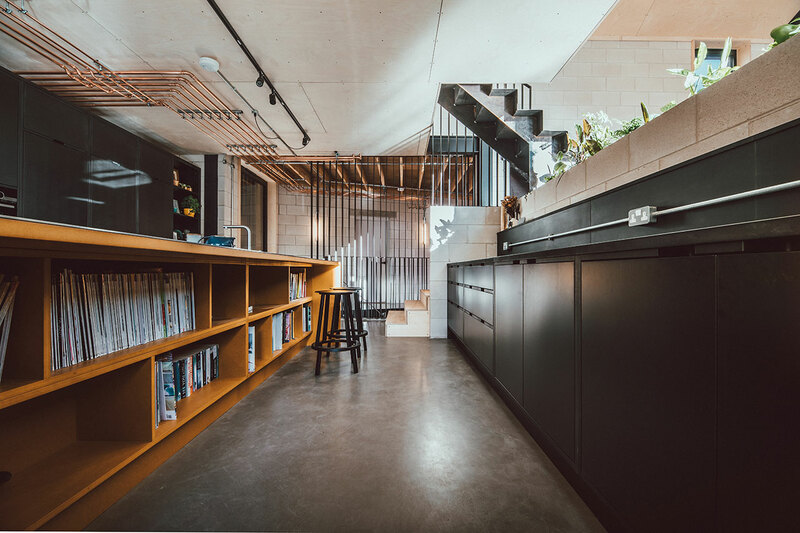 The interiors are dominated by the use of untreated materials, predominantly concrete blocks, plywood and steel, which allude to the site’s industrial heritage as well as imbue the interiors with a DIY sensibility that reference the self-built origin of the houses. 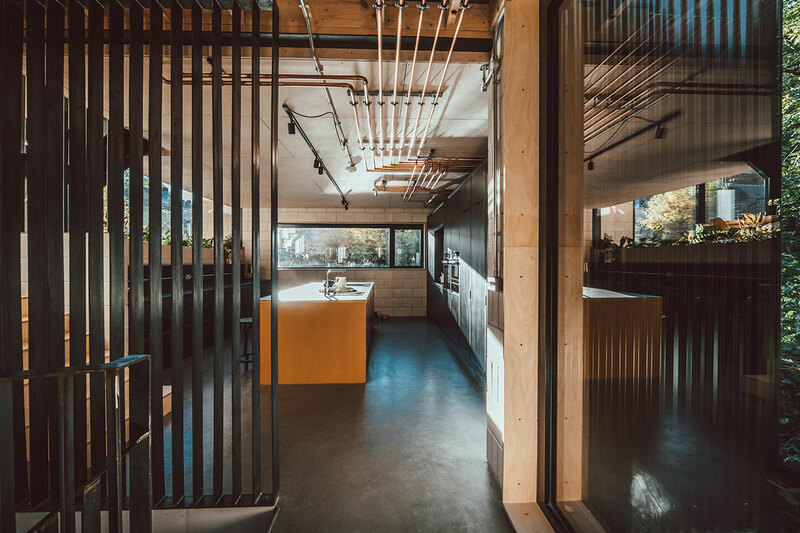 The raw, unvarnished aesthetic is further enhanced by exposed copper plumbing and galvanised conduits that run along ceilings and walls. 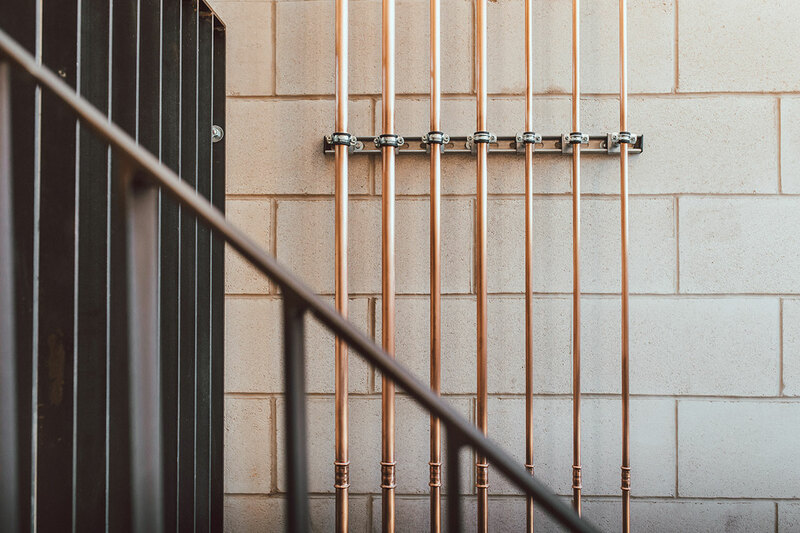 In several places, the copper pipes create interesting geometric compositions, a possible reference to the brothers’ graphic design studio DED, while in some cases the pipes are transformed into linear light fittings. 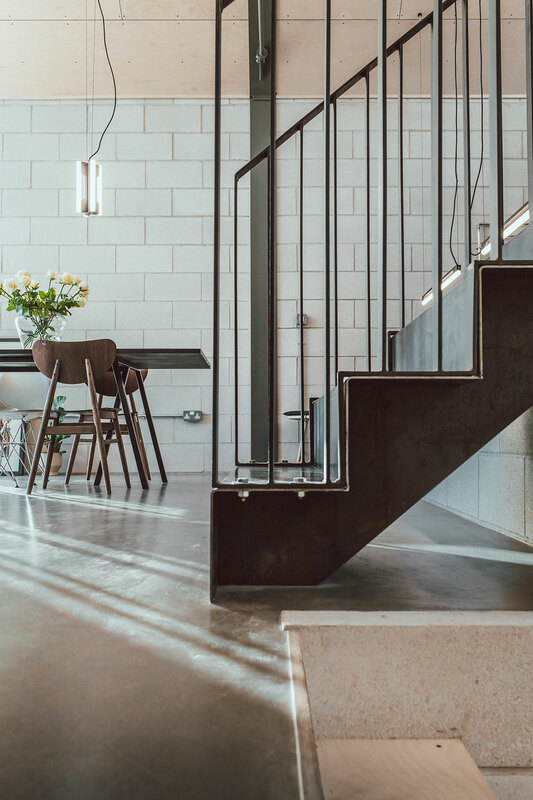 Featured throughout both houses in wall-mounted and pendant versions, these satin brass lights were developed by Nik and Jon as bold graphic lines in collaboration with lamp manufacturer TYSON Studio. 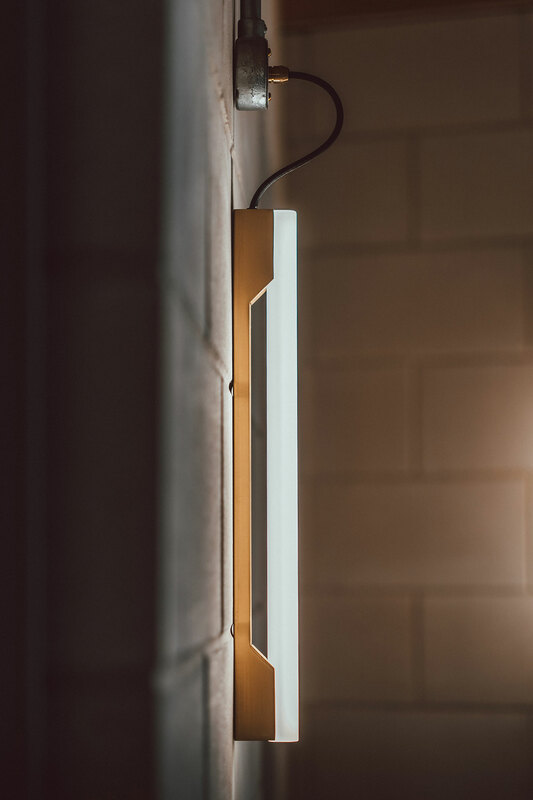 Named 'Strip", they are now available for purchase in satin brass as well as black steel in several configurations. 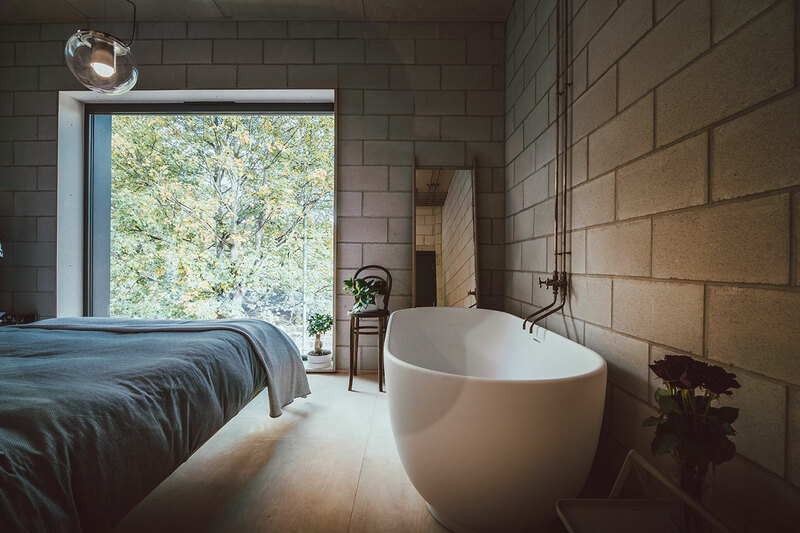 The stripped down sensibility of the interior design allows the expansive views of the pond and surrounding nature to take centre stage but have also enabled Nik and Jon to establish their own personal aesthetic through their eclectic selection of furniture, artwork and even bathroom tiles if the hexagonal ‘dandelion’ tiles in Niks's master bathroom is anything to go by. 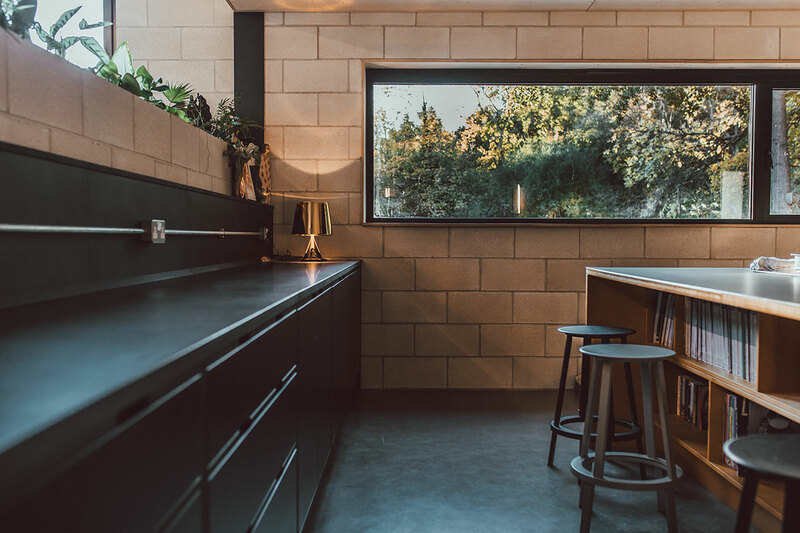 On the floor below, Nik's kitchen is dominated by the yellow Valchromat kitchen island while his passion for mid-century design can be seen in the living and dining rooms by the inclusion of classic pieces such as Charles & Ray Eames’ Lounge chair and Plastic Chair, a Robin Day sofa and Richard Neutra’s Boomerang chair by VS.
Jon’s house also flirts with mid-century modernism with a focus on Scandinavian design with pieces such as shelving by Swedish company String and chairs by Danish designers Herman Studio for Skagerak, as well as a wood-burner that has replaced the television in the living room in an attempt to bring back the art of conversation when the family sit around the fire in the winter. 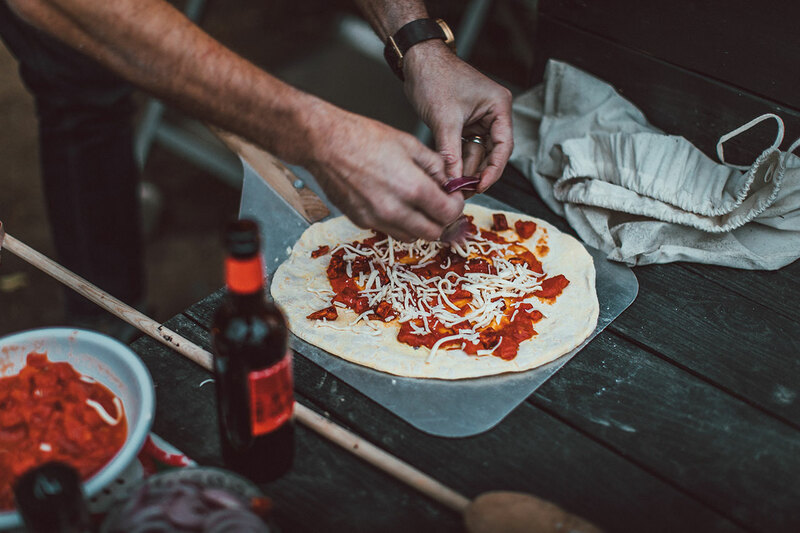 Even better, in the summer both families can gather around an impromptu camp fire in front of the pond eating home-made pizza from the outdoor wood-fire oven that Nik and Jon have prudently purchased in their quest for family bliss.